Tony's Talking Pictures Blog: New in Theaters March 30, 2018 "Ready Player One"
New in Theaters March 30, 2018 "Ready Player One"
In the year 2045, the real world is a harsh place. The only time Wade Watts, played by Tye Sheridan, truly feels alive is when he escapes to the OASIS, an immersive virtual universe where most of humanity spends their days. In the OASIS, you can go anywhere, do anything, be anyone. The only limits are your own imagination. The OASIS was created by the brilliant and eccentric programmer, who left his immense fortune and total control of the Oasis to the winner of a three-part contest he designed to find a worthy heir. When Wade conquers the first challenge of the reality-bending treasure hunt, he and his friends (aka the 'High Five') are hurled into a fantastical universe of discovery and danger to save the OASIS. 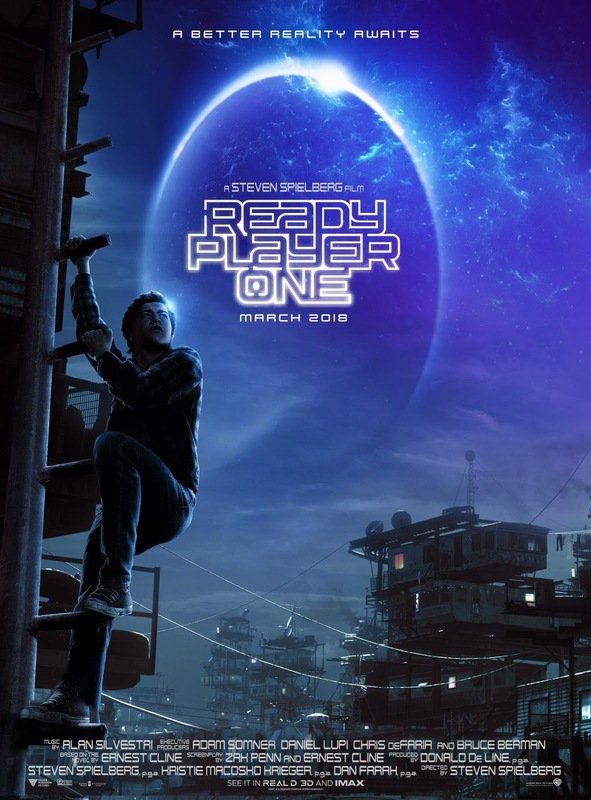 Although “Ready Player One” is based on Earnest Cline's high energy book, the film can not compete with the level of action within the novel's pages. But the film does capture the adventure and the spirit of the book. Directed by Steven Spielberg, “Ready Player One” is a love letter to pop-culture. The movie is jammed-packed with imagery and odes to iconic symbols of childhood with the background being littered with familiar faces, characters and sounds from a lifetime of loving pop-culture. Like a video game gone out of control, the movie immerses you in a world that's bright and shiny and populated with all kinds of avatars, making the digital world of the film interesting and eye popping. The digital world is counterbalanced by the grey and grungy real world, which Spielberg shot using film stock to give reality a grainy and dark feel. In the end “Ready Player One” is a film you'll need to see 2 or 3 times to drink it all in.